We have a new carving near the children's play area. It's been carved by Nathan Hughes not only as another feature for visitors to our site but also as a reminder of the importance of bees to our environment. It's carved from the trunk of a Corsican Pine which was left after we took down a number of trees in this area to allow growth of broad leafed trees. Nathan also carved a ladybird seat for the play area. Furthermore, Simon O'Rourke has fitted a new hand to the Quarryman at the main entrance, so he's back to full fitness, although he still looks too weary to ever get up again! Wrexham’s AM and MP joined us in a special tree planting ceremony as part of Manchester Airport’s 80th birthday celebrations. To commemorate their landmark anniversary, Manchester Airport are planting 80 oak trees across their catchment area, with the tree in Maes y Pant woodland being the only one located in North Wales. Wrexham’s Assembly Member, Lesley Griffiths and MP, Ian Lucas visited us on January 18 2019 with Ian Atkinson, Wrexham councillor, community councillors and members of our Group, along with Manchester Airport’s Public Affairs Manager, Samantha Atherton . Gavin Morris, headmaster of Rofft School attended along with pupils from the Rofft School, These were pupils who also attend TEMPS, the Out of School club, which MyPAG directors Rebecca and Mike are involved fortnightly. The children buried a special time capsule alongside the tree. I wonder how many years it will be before we open the capsule to reveal the secrets inside? Thanks to Mr Morris for his support and to Manchester Airport for choosing us as a suitable site and of course thanks to Ian Lucas and Lesley Griffiths for their time again willingly given and last but not least thanks to all for turning up in very, very wet weather. Mums and Dads, sorry about the children's shoes. Volunteers meet every month on the 2nd Sunday to undertake routine tasks and maintenance. it's an enjoyable and friendly gathering. We meet up at 10am at the main entrance and the session lasts as long as you want it but no more than 3 hours because before then we've stopped for coffee and cake. Thanks to Sue Britton for providing both. A sample of volunteers can be seen in the attached photo, so come along and join us if you want to do a bit of light exercise in attractive surroundings. Local historian, Brian Formstone, has been visiting Maes y Pant for years and has accumulated many records for the site. His passion is for mini beasts - insects - and he has collected much information and many samples in this time. If you want to see more then click on Images (above) and then Natural History to see what he has collected. 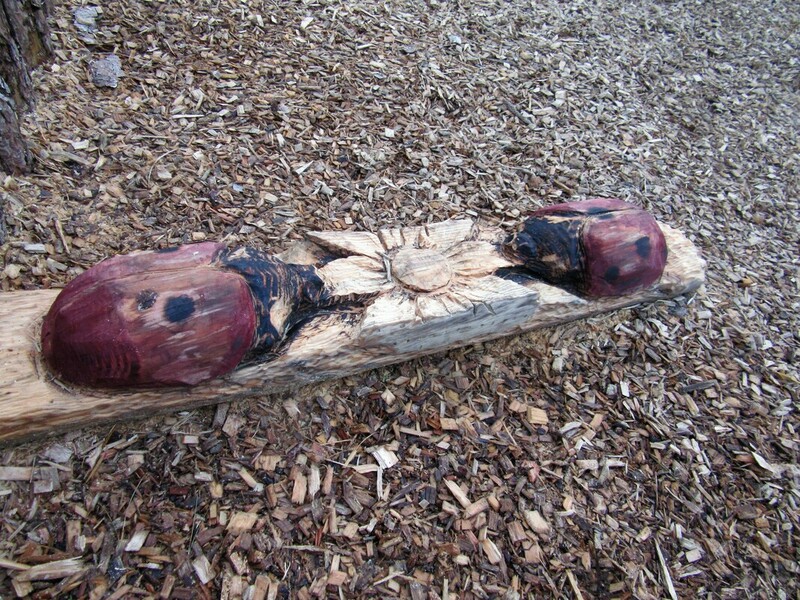 To celebrate the diversity on site we are commisioning a totem pole and seat near the children's play area which will have insects carved into the wood. We're planning for this at the beginning of February 2019. MyPAG entered a decorated Christmas Tree into the competition held at Gresford Parish Church. Excellent work by MyPAG directors Jenny Adams and Joyce Ashley with help from Gordon Adams, as you can see from the above photo, No prizes this time though, as the standard was very high and the competition very keen from the 44 entries. Well done to the Scouts for their winning entry. With 44 trees shining away, the Parish church looked beautiful inside, so I couldn't resist taking some general photos which I'm including here as well. Two of MyPAG's directors, Mike Thomas and Rebecca Hennessey, take some of the children in the post school group run by Beryl Blackmore at the Rofft School, down to the Maes y Pant site for one evening a week. 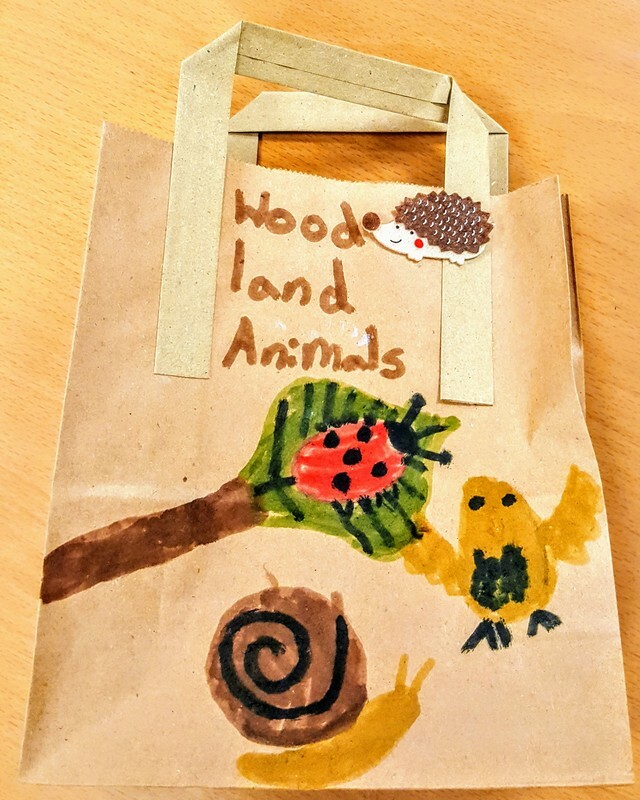 Mike and Rebecca run events to help identify wildlife on site and help the children get involved with natural history as well as learning learn basic craft skills from the material found in our woods. You can see some of the children's latest work in these pictures. Fantastic. Well done to the children and a big thank you to Rebecca and Mike. Mike even takes a little time off his regular work to help run these sessions. They'll be taking a few weeks off now that the winter night's have drawn in. 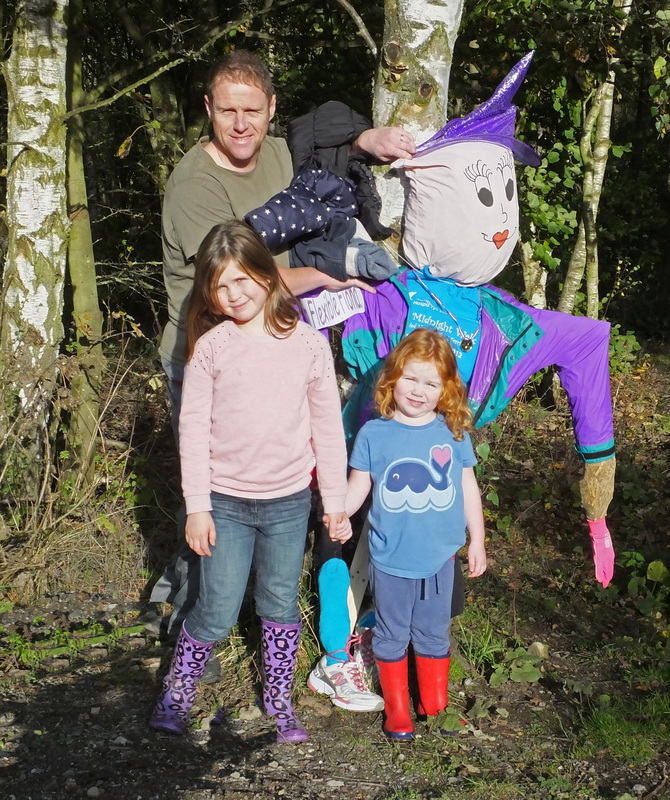 The Gresford Scarecrow Trail is now becoming a tradition. I think we can say that now it's in its third year. The theme this year is 'Fairy Tales and Nursery Rhyme Characters. This is the first year that MyPAG has decided to enter, thanks to the efforts of Gail Caswell-Jones and her family. Can you guess who it is from the photo, but it does have a Disney fairy tale twist. A very handsome effort, Gail. The trail starts on 18 August and lasts until the 1 September. All the scarecrows will then be brought together for a Scarecrow Tea in Allington Park, High Street at 2pm, Saturday 8 September. For further information please visit the Gresford Community site on www.gresford.org.uk. We've decided not to keep our scarecrow at Maes y Pant but you can see him just up the road in Pant Lane on the opposite side of the road to Quarry Brow. Hope you have fun on the trail. We have a new carving at Maes y Pant. One of two remaining 2m stumps left after we cleared an area of Corsican pines has now been carved into a giant love-spoon. This has been thanks to the skill of Wayne Crumpton, who lives in Lymm, Cheshire. The new carving is close to the children's play area. Wayne has donated his own time to make this creation. Although Wayne denies it, the mask on the back I'm told bears a passing resemblance to the chairman of MyPAG! I wonder; I can't be that ugly. Below are some photos of Wayne at work and the finished article. Keep Wales Tidy has unveiled this year’s Green Flag Award winners – the international mark of a quality park or green space. In total, 112 community managed green spaces in Wales have met the high standard needed to receive the prestigious Green Flag Community Award (101 in 2017/18). These sites rely on volunteers to maintain their excellent facilities. Maes y Pant has received this in recognition of its excellent facilities and commitment to delivering great quality green space. We are very pleased to receive this for a third consecutive year. It’s a reward for a lot of hard work in maintaining the site over the last 12 months. As a reminder, we hold monthly volunteers’ mornings that are held every 2nd Sunday of the month (meet at the main entrance at 10am). If you wish to become a supporter and join the Friends of Maes y Pant for as little as £10/year then an application form can be downloaded from our website. “We’re delighted to be celebrating another record-breaking year for the Green Flag Awards in Wales. All the flags flying at community sites are a testament to the dedication and enthusiasm of local volunteers who work tirelessly to raise the standard of our green spaces. Thanks to Matt Perrins and the Finance team at MBNA, Chester, who visited Maes y Pant on Tuesday 12 June to help clear litter from the site. This was part of a continuing initiative by MBNA to help local community and charity organisations. They took advantage of the fantastic weather to clear some litter on site. Hope to see you visit us again. Please come along and support Maes y Pant’s Plant Sale and Coffee Morning which is being held on Saturday 5th May in Church House, Gresford. There will be plants, cakes, books and a bring and buy stall as well as a raffle. The event runs from 10.00 - noon. Admission is £2 (accompanied children free) and tea, coffee, juice, biscuits and tea cakes are included in the admission charge. Donations of plants (indoor and outdoor) and stalls are most welcome - please leave plants in front of Church House on Friday afternoon 2-6pm, or bring along on Saturday morning 5 May after 9am. All funds raised will be used for work and projects in Maes y Pant. The Gresford & District Community Library will also have a stall and will be selling donated books, so if you're looking for holiday reading then this is the place! Funds from the sale of books will go to the Community Library. 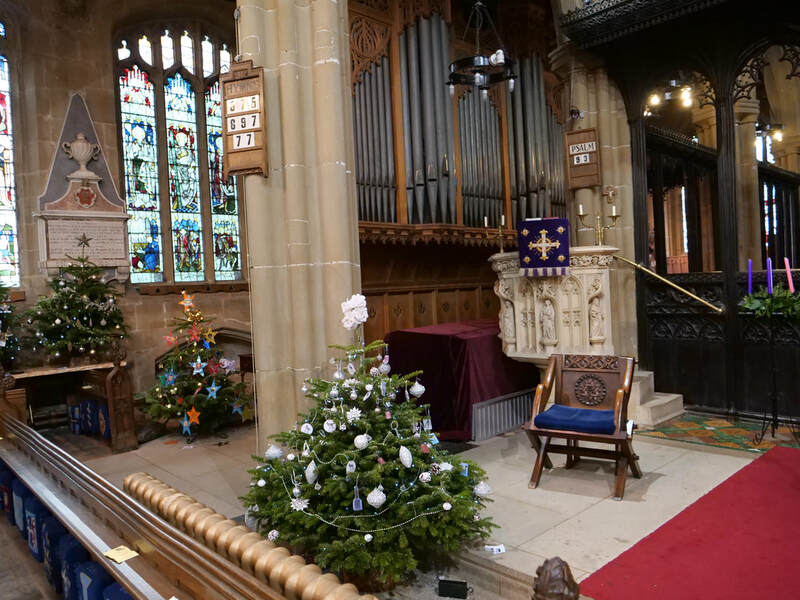 Around 30 local businesses, charities and voluntary organisations including Maes y Pant have adopted and decorated Christmas trees in All Saints Church, which are all on display from Wednesday to Sunday this week. There is an opportunity to vote for your favourite tree if you wish to do so. Refreshments available, craft activities on site too if you want to try out something new. from Maes y Pant, and decorated the tree on our behalf. And even added their signature - spot the 'J&J'! 'Trees for Kids' project as one of three local projects to benefit from income from sales of their own-brand products for 12 months until the end of October 2018. The funds will go towards buying broad-leafed trees for Maes y Pant to replace some of the Corsican Pine trees removed earlier this year, which were non-native trees and have very little ecological value. The trees will be planted by, or for, local children aged up to 11 and we aim to fit name tags to the trees so the children will have a sense of ownership of their own tree. We hope that this will engage the children with Maes y Pant, with wildlife and nature, and encourage them to enjoy and respect the environment. To help us with this, if you have Coop membership we need you to log onto www.membership.coop.co.uk and find 'Choose a local cause', then click on 'Maes y Pant Trees for Kids project'. There is more information about the project on the Coop site, and the funds come directly from the Coop, they are not taken from your 'Divi'. 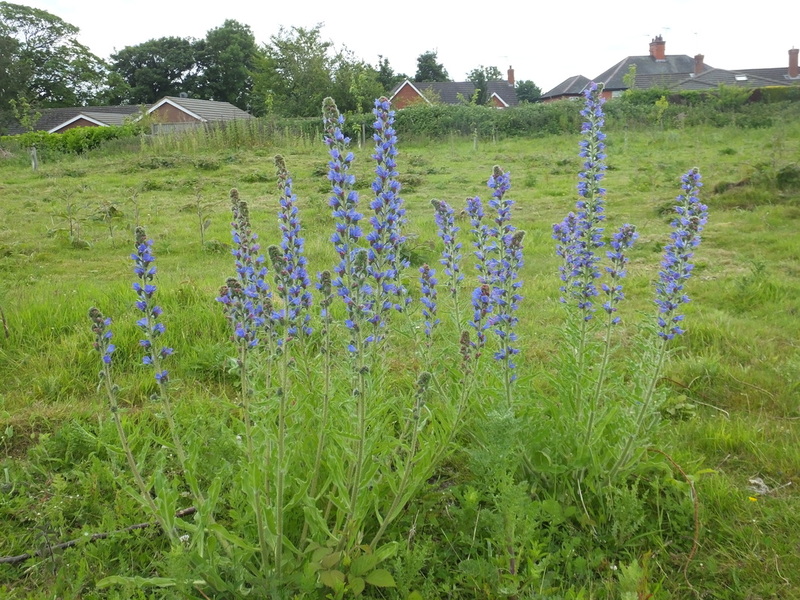 A couple of years ago, Gresford Guides planted some wild flower seeds in our meadow area. These were perennials so they took a little time to settle in but look at the results now - and the heritage apples we planted 3 years ago have done well as well. Mallows and bugloss have been spectacular and the rabbits even left us some cowslips in the spring. Thanks to Megan Hughes for the successful bid for funding and to Beryl Blackmore and the Gresford Guides for their efforts planting the seeds. Another area at the far side of the meadow was planted with a Montgomeryshire Mix and this has put on another great display. Thanks to Norma Williams who has been a regular walker with Actif Woods for buying these for us. These areas have now (September) been mowed so we hope for even better results next year! This year we applied for seeds from the Kew Gardens Wildflowers project. This time St Peter's School, Rossett is involved with us led by Ceri Peacock. The children made the seeds up into little clay 'bombs' and will be planting them in October - again in the meadow. 4 patches have been cleared for them. Really looking forward to the results. Well, we're pleased to say that we are getting plenty of use out of our our refurbished and new facilities. Here's some photos to show what we've been up to so far in 2017. 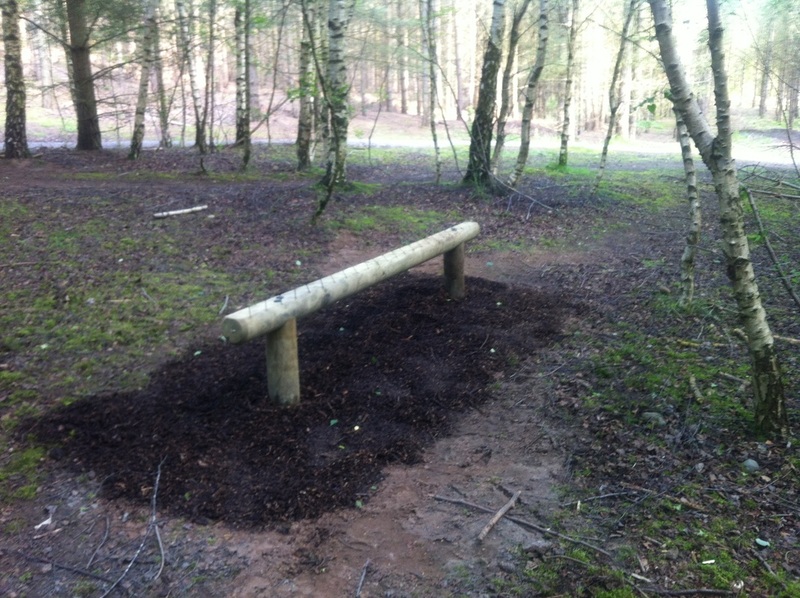 Apart from the new gym equipment, we've re-made the steps to the viewpoint - no excuses for not using them now -and we've laid a wood chip surface in the woodland play area. Hope you enjoy them. Oh and I couldn't resist including a couple of photos of Jessica, a visitor to Gresford, who really enjoyed the play area before we laid the wood chip. If you went down in the woods on Sunday 23 April you might have had a big surprise. A pleasant one we hope. 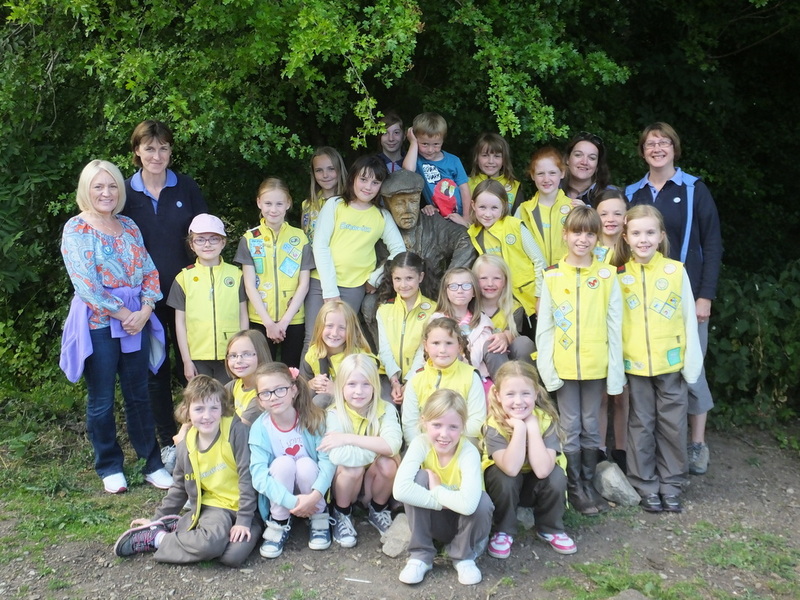 Beryl Blackmore and the Gresford Guides had organised a bear hunt in aid of their funds. Good time had by all. and what we've spent the money on! Back in December 2016, Tesco customers voted to award funding from the sale of 5p plastic carrier bags to local projects. 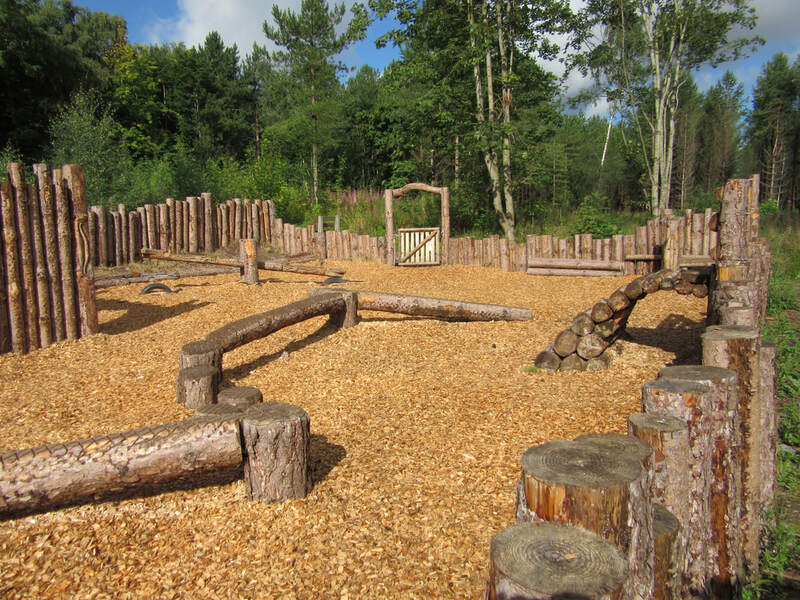 Maes y Pant was awarded a whopping £12,000, which has been spent on a woodland adventure play area for young children: and for our bigger kids and fitness enthusiasts, some monkey bars and overhead rings for the woodland gym. 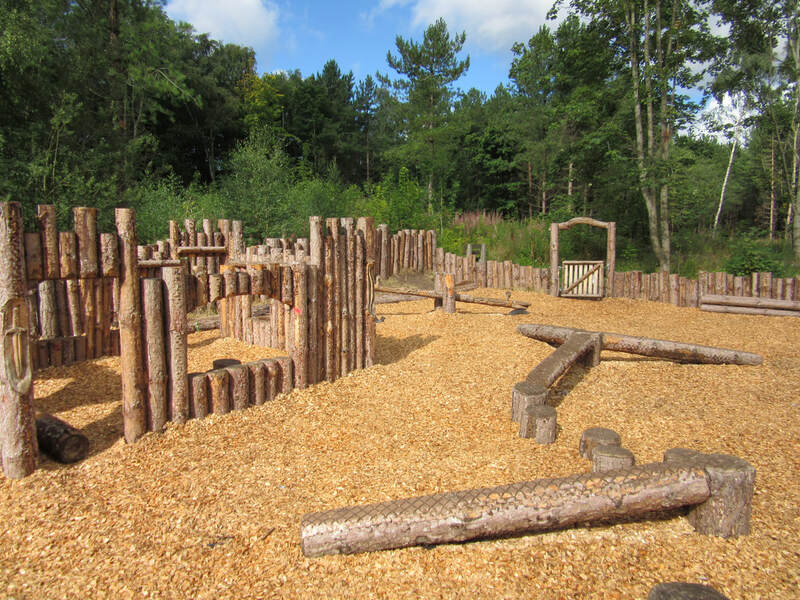 The children's play area was created by Simon O'Rourke and his team almost entirely from wood felled during the work that took place in February. 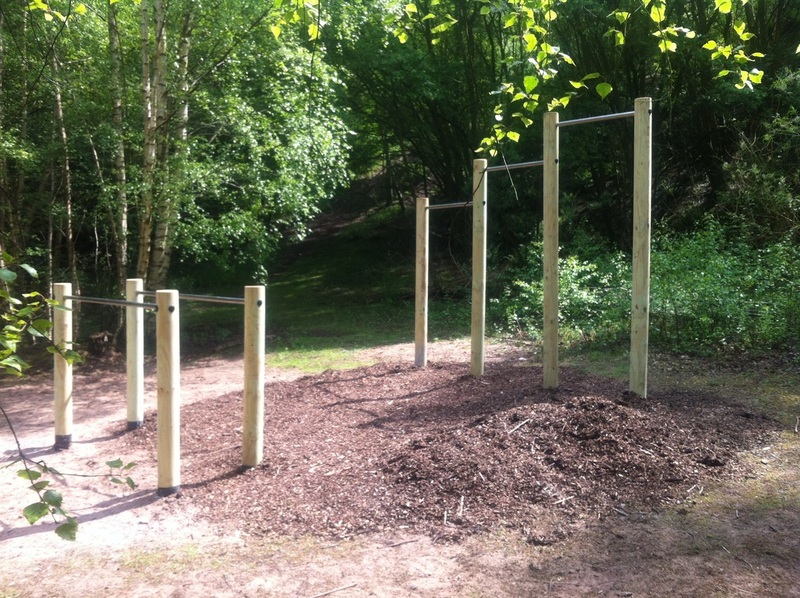 The woodland gym equipment was supplied and fitted by SportsDirect, who had supplied some of our earlier equipment. And a heads up to Claire Sutcliffe and her Boot Camp team who held their own fund-raising event to add a boost to the equipment funding. We hope that these additions to Maes y Pant will add to the enjoyment of our many users of all ages. It's that time of year again ..... our annual fund-raiser and social event has been arranged for Saturday 20th May, 10am in Church House, Gresford (LL12 8RG) and we look forward to seeing as many of you as possible there. We will be grateful for donations of any plants, cuttings and seedlings that you can spare. All funds raised will go towards maintaining Maes y Pant, and we always look forward to hearing your (constructive) ideas, comments and suggestions for future work and improvements. So please come along and join us for tea, coffee, juice, teacakes and biscuits, cake stall and raffle and to donate / sell / buy lots of plants. Our thanks to everyone who turned out to join us for the 'Hog Roast' on 8th April. Perfect weather, over 100 people accepted our invitation to the event. Amongst the guests were Simon and Liz O'Rourke - Simon and his men were responsible for creating the new Childrens Adventure Area which is already attracting lots of excited children. Representatives of Tesco, who funded the Adventure Area from their 'Bags for Life' community grant scheme came along and ended up with a job serving up the pork baps (thank you so much, we loved having you with us). It was good to see representatives of our local Community Council who have supported our project in the past. Thank you too, to the Big Lottery's 'Community Celebrations' grant which funded the event. Finally thanks to the directors of Maes y Pant who helped with the organisation, serving food and drinks, and of course to everyone who came along and supported the event. Thanks to a grant from the Big Lottery 'Community Celebrations' award scheme, Maes-y-Pant are holding a Hog-roast close to the car park on Saturday April 8th from 1.30pm to celebrate receiving a 'Green Flag' award for the site. Also hopefully, to celebrate completion of the childrens adventure play area. We are inviting all those people who have helped over the past six years to get Maes-y-Pant up and running - people like the Friends of Maes-y-Pant; Gresford Community Councillors; Maes-y-Pant Board members, and neighbours of the site as well as other individuals who have supported us so strongly. Numbers are limited and invitations will be sent out shortly, so if you receive one please be sure to respond so that we can cater accordingly. There are likely to be over 200 people attending and we will need to maintain a list of acceptances to make sure everyone who replies to the invitation is fed! For people whose email addresses we have on record, you will be contacted electronically. Where we only hold addresses, you will receive a letter before the end of March. ​We look forward to meeting you in Maes y Pant on 8th April, and thank you for your continuing support. And please, bring the sunshine with you!! Please be aware that commencing late January / early February 2017, contractors will be on site. They will be felling trees as part of improvement works to thin out the Corsican pine trees and to create clearings. This work, which has been approved and licensed by National Resources Wales (NRW), will allow more light into Maes y Pant and enhance the wildlife, flora and fauna on the site. We hope to keep Maes y Pant open during these works, but please be aware of the dangers of heavy machinery on site. Make sure to follow any cautionary signs and directions from contractors and MyPAG officials. Part of the car park will be closed to ensure that contractors vehicles have continuous access as required. 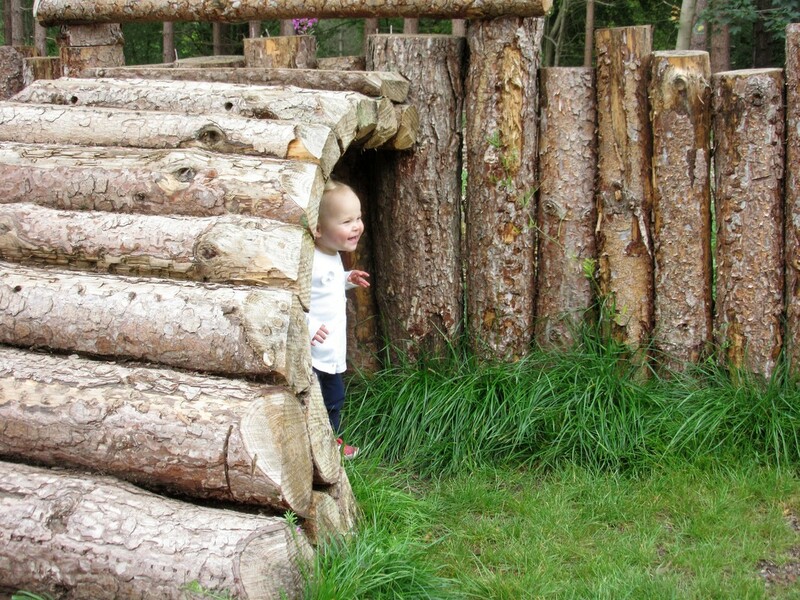 Also during the winter, an adventure area for young children will be created using wood felled on site. Funds for this project have been provided by Tesco 'Bags of Help' scheme. 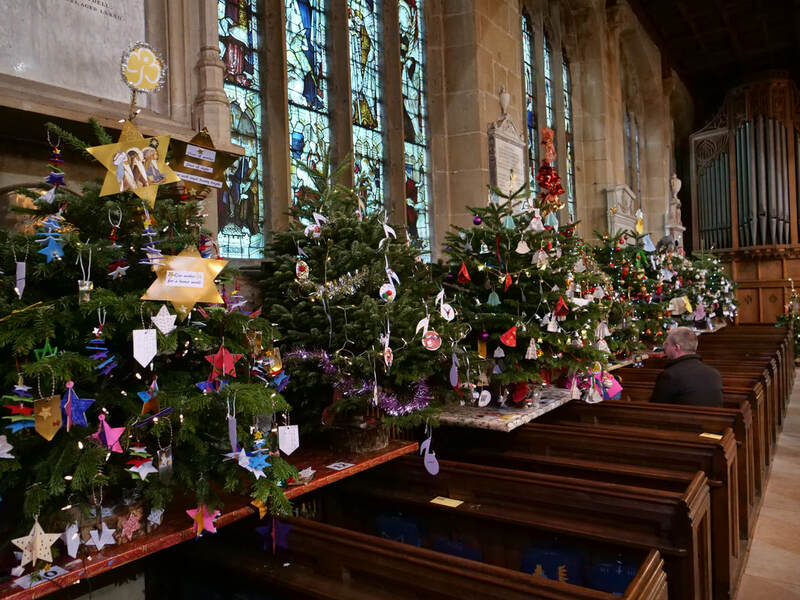 Along with 35 other local groups and organisations, Maes y Pant participated in the Christmas Tree Festival in All Saints Church which took place from 1 December until 7 December, from 10-5 daily, 10-4 Saturday and Sunday. 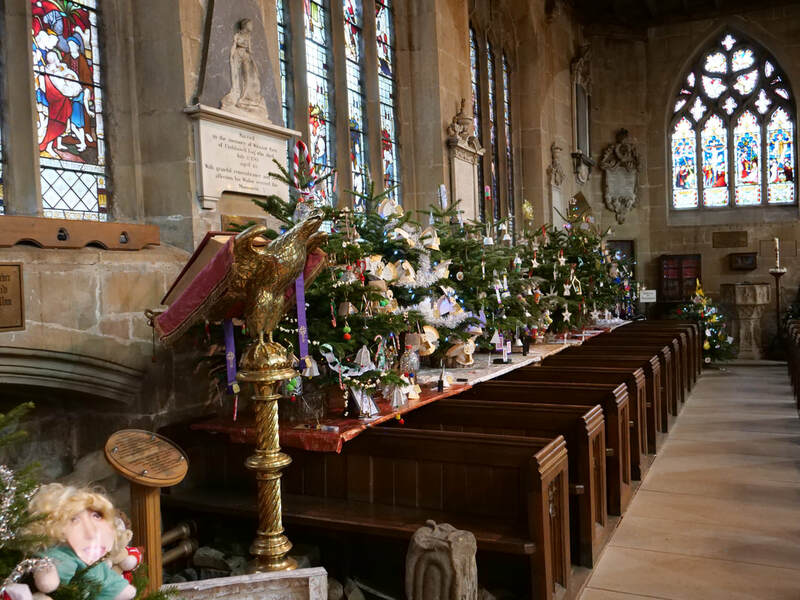 Well worth a visit, lots of effort went into decorating the trees and they lookedsplendid in the wonderful, atmospheric setting of All Saints. Our thanks to Joyce, Jenny and Gordon for their creative decorations! Proceeds of the event (£1200) were donated to Hope House and Nightingale House Hospices. We heard from Tesco this week that MyPAG gained most votes for our Childrens Woodland Activity Area project in store, which means we now have an additional £4,000 towards our projects - £12,000 in total. So, very many thanks to everyone who voted for our proposal, we can't wait to get started with building the woodland activity area, and we hope to add monkey bars for the woodland gym. And more signage if the funds stretch far enough. Work is most likely to start after the next phase of Corsican Pine tree clearance early in 2017. Tesco has teamed up with Groundwork on its Bags of Help initiative in hundreds of regions across England and Wales. The scheme will see three community groups and projects in each of these regions awarded grants of £12,000, £10,000 and £8,000 – all raised from the 5p bag charge. MyPAG has been chosen as one of these 3 groups in our region and we would ask you to vote for us. The more votes we get, the more chance we have of the higher sums. The money will be used to develop a woodland activity area for children and if we have enough money then set of monkey bars for the gym and some extra signage. Bags of Help offers community groups and projects in each of Tesco’s 416 regions across the UK a share of revenue generated from the 5p charge levied on single-use carrier bags. You will be able to vote in store from 31st October – 13th November on who should receive the £12,000, £10,000 and £8,000 awards. In total, there is over £12.5 million up for grabs. MyPAG had a good presence at the popular Gresford Summer Festival on Sunday September 11 2016. Congratulations to the organisers from the Gresford Trust for a very successful day. Plenty of residents and others turned up to support the event and the warm sunny weather encouraged a good turnout. We were very pleased to meet a number of old friends who popped over to our stand to say hello and have a go at our Tombola or the Treasure hunt for children. Even so, the plant stall attracted a lot of new acquaintances as well. Overall we made £135.21 plus a further £16 donated by MyPAG member, Kim Patel, who was running a dog agility show at the Festival. Thanks to all who contributed and in particular to Sue Kelly for her work behind the scenes. Sue can be seen working on the stall with 2 other MyPAG members, John Troth and Robin Thomas (who is selling hard). MyPAG has joined forces with other groups responsible for parks and green spaces in the Wrexham area to develop an exciting project to deliver improvements and take forward new ideas for the green spaces in Wrexham. We want people to want to come to our sites in Wrexham and enjoy them. If successful the project will be funded by the 'Create Your Spaces' initiative of the Big Lottery Fund. The development of this project has been led by volunteers from seven of Wrexham’s Friends Groups, (Friends of Ty Mawr, Nant Mill, Bellevue, Alyn Waters, Moss Valley, Ponciau Bank and Acton Park) in addition to a community woodland group Maes y Pant Action Group (MyPAG), North Wales Wildlife Trust (re Marford Quarry) and Keep Wales Tidy. The project has successfully reached Stage 2 of the Big Lottery Fund process. Over 50 bids have now been reduced to 16 across the whole of Wales and the Wrexham Green Spaces project is one of those. The lead group, Keep Wales Tidy, has now received £20,000 to enable us develop the project to provide a detailed bid. Our completed bid must be submitted by 7 December 2016. Only 8 of the projects will be successful. To help us understand what people in the Wrexham area would like then we are asking you to tell us by completing a very simple questionnaire. The best way to do this is to go to www.surveymonkey.co.uk/r/YS66CNQ (English) or www.surveymonkey.co.uk/r/2QZGLSK (Cymraeg). It takes less than 5 minutes. More exciting news, we now have a woodland trail starting from the main entrance in Pant Lane and following the all abilities path in a figure of 8 and back to the entrance again. There are 20 plaques hidden (most are not that hidden) in the trees of 20 woodland creatures or plants that you could see in Maes y Pant. The full list is: Badger, Bat, Bee, Butterfly, Fly Agaric (a type of fungus), Frog, Fox, Hedgehog, Ladybird, Millipede, Newt, Oak Leaves, Owl, Rabbit, Red Kite, Robin, Snake, Spider, Toadstools, Woodpecker. To help, you we've drawn a map of the route and where you should see a plaque and you can see this below. Here are a couple of pictures of plaques and the situation you might find them in. We've also given you a clue as to where 2 or 3 are. Happy hunting. Well done to Ed Fleming, whose plaque designs won our art competition during summer 2015 and to his parents, Mark and Monica, who helped produce and install the plaques. Many thanks to all 3. Prince Gwyddion, son of Don, is a hero, trickster and magician in Welsh mythology. He's come to stay at Maes y Pant in his wizard form. His name means 'Of ' or 'From the Woods' and you'll see what it means when you meet him. His wizardry has meant his name has confounded us whether it has one or 2 'd's or an 'e' instead of an 'o' but he's not complaining he's here to stay. MAES Y PANT has been awarded prestigious 'Green Flag' status, in recognition of the success of the project in terms of Welcome; Health and Safety; Cleanliness; Sustainability; Conservation; Community Involvement; and Achievements since the project started six years ago. Maes y Pant is one of the very few community owned and managed sites throughout the UK to have achieved this status, and the success is in large part due to the efforts and hard work of all the volunteers who give freely and generously of their time and energy in order to make Maes y Pant a place for relaxation, and enjoyment for the whole community. Our thanks to all our volunteers for helping us to achieve this status. Back in May, world champion tree-carver Simon O'Rourke came on site to reduce the stump of a tree near Whiteway Drive entrance to Maes-y-Pant, that blew down in storms around 12 years ago. The intention was to leave around 10 feet into which Simon was to carve a wizard. Unfortunately on the day, it was discovered that the stump was diseased therefore unsuitable for the purpose. 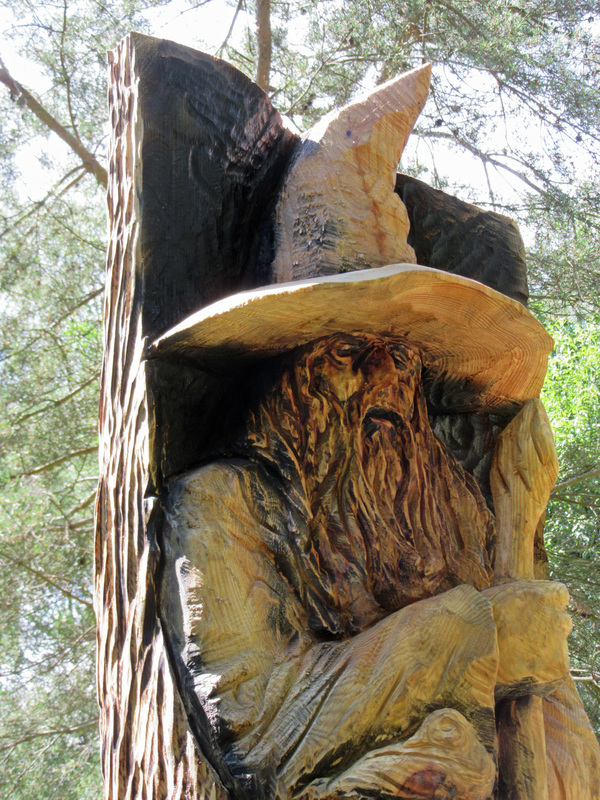 This week the alternative scheme takes place, and this sees Simon carving a wizard in his workshop, and the carving will be secured to a stump in the arboretum on 14th or 15th July depending on weather conditions. The wizard has been named 'Gwydion', which translates as 'born of trees' which seems a very appropriate name we think. Funding towards the cost of this project has been provided by the Community Foundation in Wales, and came via the Asda carrier bag fund. We hope to have the clay plaques designed by Edward Fleming displayed in the arboretum very soon. Edward was a winner in our Young People's art and design competition last summer, and his designs of 20 plaques depicting wildlife that can be found in Maes-y-Pant have been cast ready to be hung in the trees to form a trail. So some changes to the area, which we think will enhance your enjoyment! ​Once the projects are in place, do please let us know what you think. 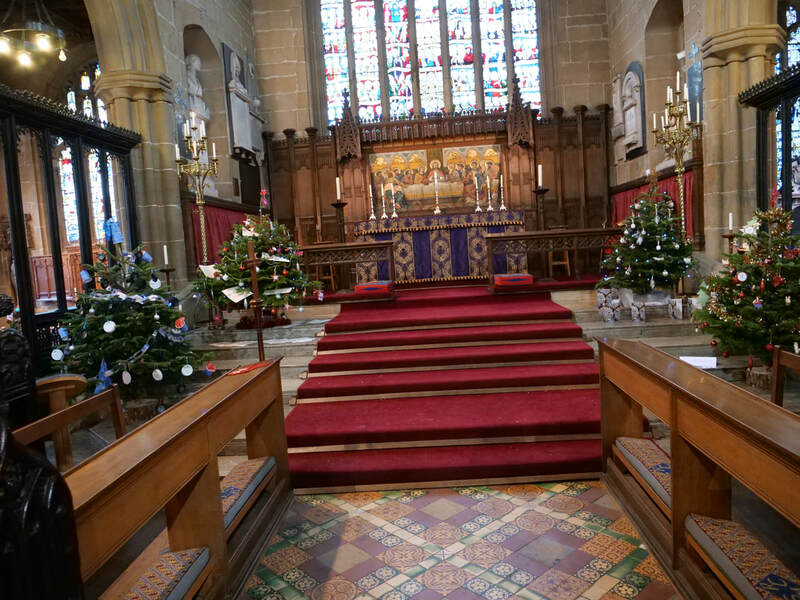 in Church House, Gresford (LL12 8RG) . Admission £2, accompanied children free. Tea, coffee, juice, scones, teacakes, biscuits included. ​There will be (as you would expect!) a plant stall: also cake stall, bring and buy stall, and a raffle. Proceeds for benefit of Maes-y-Pant projects and running costs. Thanks to everyone for your support - we raised almost £400 for Maes-y-Pant funds! ​A reminder that we have our 3rd annual Friends meeting on Monday 11 April, to be held at Church House, Gresford at 7.30pm. This is an opportunity to join the Friends and hear about future plans as well as giving us your ideas about what you think we should be doing which will benefit the community. On this date, we have some horse logging from 9 am and continuing all day. A number of pines by the pond are being taken down and we have hired Ecological Land Management (ELM) to use 2 working horses - see photo - to pull the trunks from there to near the main entrance. A mighty effort up the slope from the old quarry base. ELM is a conservation and wildlife protection company based in Llay and did a great job for us when they built our pond. It will be fantastic to see these working horses in action. Please come and see them and enjoy traditional skills. ​JANUARY 2016 - We had a very productive morning at our volunteers’ meeting on January 10. Nine volunteers started the morning clearing the ground in our arboretum area where we plant non native trees. The idea was to plant 50 saplings. Two young helpers joined us, who made sure they were going to help by planting a sapling each. The saplings had been supplied free by Ovo Energy through The Conservation Volunteers (TCV) organisation. 40 saplings were planted in the arboretum, which were berrying shrubs such as spindleberry, guilder rose, wayfaring tree and dogwood to encourage more visits by birds. We were also able to plant 10 goat willow in one of the clearings within the site as part of our plan to replace the conifers with native trees over a number of years. ​If you would like to join our volunteers group then we meet every 2nd Sunday of each month at the main entrance on Pant Lane, Gresford at 10am. We’d be pleased to see you and you may even get a free slice of cake as well as coffee. The meeting next month is on Valentine’s Day (no significance). The following meeting will be on March 13 when we’d like as much support as we can get as we have 420 saplings to plant. This is Sam Dale, aged 5, who helped us plant a tree, although he didn't think trees could be so small! Good job, Sam. This is Joe Dale, aged 3. he had to do what his brother did - and another tree was planted. Well done, Joe. EARLY SEPTEMBER - The pond is very full of water following recent rainfall, and in some places the sides have washed away into the pond. We are having a volunteer session early in September to restore the sides. Please can we remind users NOT to walk into the pond (dangerous and damaging), or encourage dogs to swim or run in after sticks (disturbs wildlife, and our volunteers have plenty to do without having to remove sticks!). The pond was sited principally for environmental reasons: the side has its own fragile ecosystem and we are trying to encourage it to establish. An established pond which is respected by users should ultimately be a calm, peaceful and very enjoyable haven both for humans, and for wildlife. JUDGING OF THE ART AND DESIGN COMPETITION TOOK PLACE ON 2ND SEPTEMBER. Winners to be announced at the Gresford Festival on Sunday 13th September. Our thanks to the competitors, and to Gresford Community library for collecting in the entries. We had some very high quality entries which have provided ideas for several artworks that we hope to carry out when funds allow. And special thanks to Simon O'Rourke, internationally acclaimed tree carver, who came along to assist with the judging. Simon identified several potential projects from the entries, and will be working initially with the one of the prize-winners to help turn their vision into reality. Entries will be displayed at the festival, and will be on display at Maes-y-Pant following the distribution of prizes. The winners were announced for our summer artwork competition at Gresford Festival on 13th September. There were 3 category winners but no entry for the 5-7 age group! Edward Fleming was the winner in the 7-11 age group category. His idea is to set up a nature trail using clay plaques as a guide and he illustrated 6 of his suggestions. The clay plaques would be animals found in the woods and attached to trees. The plaques would be painted and fired in a kiln at his home. Lucy Armitage was the winner of the 11-14 age group category. Her design is of a dog ( a labrador puppy me-thinks) with a butterfly. The statue would be made of wood and metal and mounted on a pedestal. "Yr Wy" - "The Egg" won the 15-18 category for Philippa Thomas. The egg represents the 're-birthing' of Maes-y-Pant and the circle of life of the woodland animals. The hole frames the landscape and can provide seating. Each of the winners received a prize of £25, which was presented to them by the Mayor of Wrexham, Councillor Barbara Roxburgh. 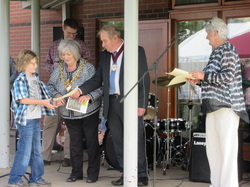 Edward Fletcher is seen receiving his prize at Gresford Festival. There were also 5 'highly commended' entries from Lottie Conway, Amelia James, Charlie Jones, Hannah Powell-Jones and Angelina Williams. The entries were to a high standard of entry. Well done to all! We're looking for helpers to join us for some scything and raking exercise in the meadow area just behind Pant Lane, on Sunday 30th August. Meet at the Main Entrance at 9.30am or come and find us in the meadow. If you want to try your hand at scything this is your chance - we also need volunteers to rake up the hay. Our scheduled Volunteer session on the second Sunday in September is being deferred until 27 September, as the Gresford Festival takes place on Sunday 13th. The session on 27th Sept is to help us plant cowslip and foxglove plants on site, and to clear four patches in the meadow to sow more wildflower seeds. Meet at 9.30am at the Main Entrance. As always, all welcome to come along and help at these sessions - maybe some younger volunteers might like to join in? Following our success in the Airbus / Leader awards when we received £500 towards a project working with children and young people to design artwork for Maes-y-Pant, we are organising a design competition to run over the summer until 31 August. We would like young people to submit ideas, drawings, designs for a sculpture or piece of artwork that you would like to see created, and sited in Maes-y-Pant. The designs can be for a project in any medium you feel would be appropriate for the outdoor environment, eg wood, stone, ceramic, metal, and will need to be hardy enough to stand up to extremes of local weather. There will be four age groups, 5-7; 7-11; 11-14; 15-18 years of age, and there will be a £25 book token prize for the winner of each group. 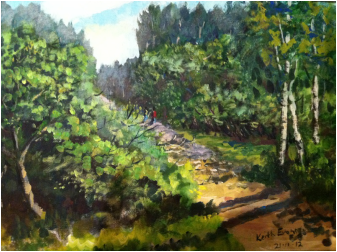 Winners to be announced and artwork to be displayed at the Gresford Festival on 13th September. Winning designs, provided funds allow, will be created and installed on site. All entries should be delivered to Gresford Community Library by 31 August 2015, and will be considered by a panel of judges appointed by MyPAG following closing date for receipt of submissions on 31 August 2015. Judges will include Simon O’Rourke who created ‘Stan’, the pensive quarryman who sits at the site entrance. Please remember to write your name, age and contact details on your design! 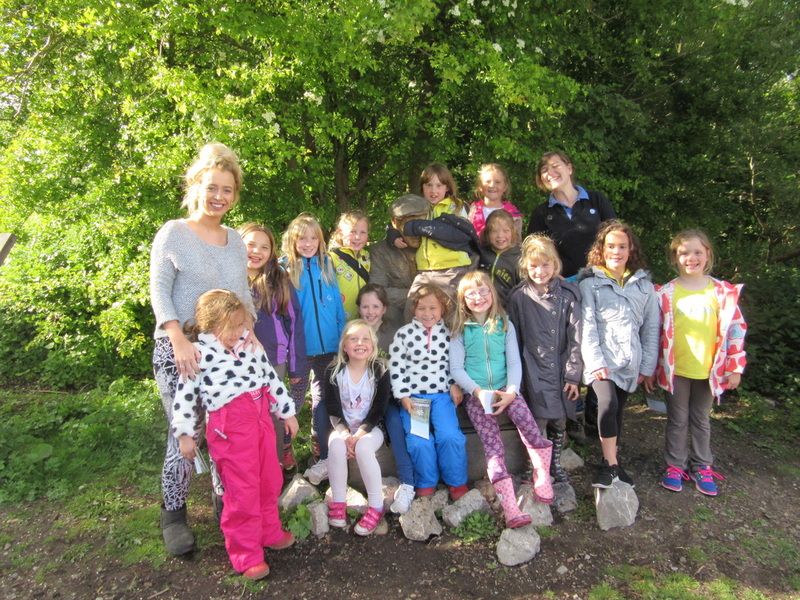 Brownies and badgers groups have filled the air with excited chatter over recent weeks in Maes y Pant. Some groups have planted seeds and foxgloves but the main excitement has been dipping fishing nets into our new pond to see what's there. I thought - very little - as the water is a soupy brown colour from the sand base and dogs practising their diving skills but how wrong could I be as the weeks passed by. 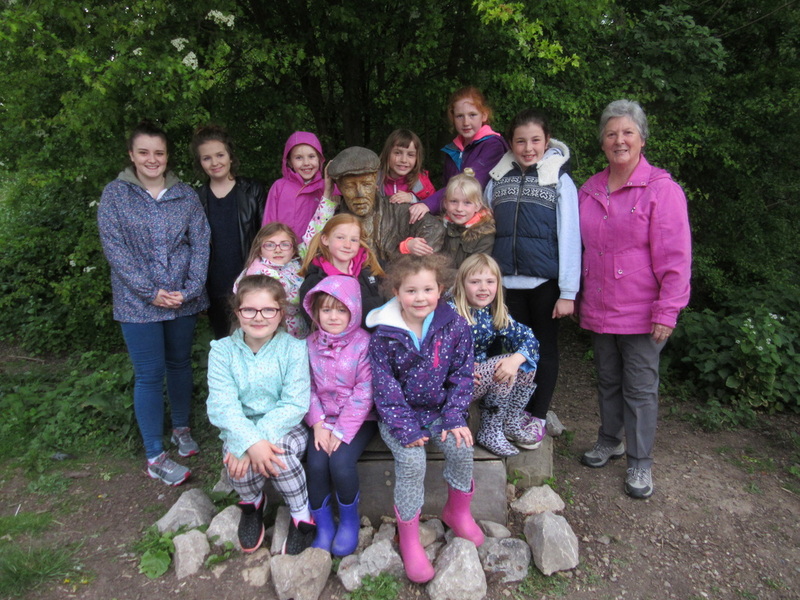 The first group to visit was the 2nd Gresford Brownies on 7 May 2015. Theirs is the first photo taken surrounding Stan our wooden carved quarry man. First, we did some seed sowing before pond dipping. I was pleased that we found water boatmen and the expected pond skaters and I was very pleased when a large diving beetle plus a smaller one was netted but then 2 tadpoles were caught, one big and fat and the other smaller. We had no idea that frogs had laid spawn. The second group was the Strode Badgers who visited on 15 May. They caught plenty of pond skaters and water boatmen and one tadpole. We held off from the original date because of heavy rain, so again it was a lovely evening. Gail Woodward kindly brought some foxgloves for planting which we did, but I fear they've perished. We also planted seeds. However the idea was a good one and we've planted some later which he hope will survive. 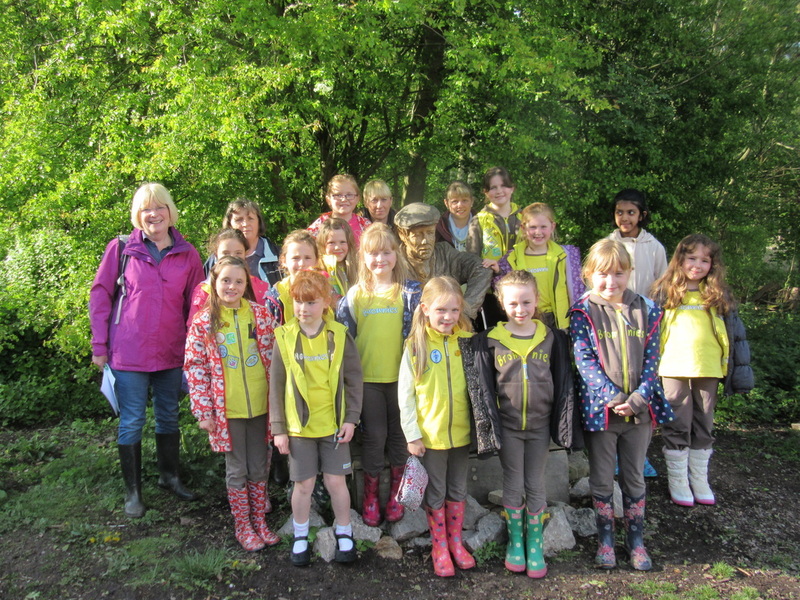 The third group was the 1st Marford brownies who visited on 19 May. Again we did some seed sowing and collected various pond insects to display in the white trays especially bought for the purpose. By this stage I was thinking that it's no wonder Stan was looking weary. Last but not least were the 1st Gresford brownies on 23 June, which was yet another lovely evening. This had been arranged quite late on but the pond dipping results were spectacular. The group was divided into 2. One section planting some foxgloves near the pond (I've learned - they need to be near a convenient water source) whilst the other pond dipped and then swapped over. I wasn't able to fully check what was collected but there were at least 7 little frogs plus at least 2 tadpoles complete with back legs only and 2 newtlets were caught. The last were new as no newts had been found in this area before we made the pond. Whilst we were there a dragonfly (male broad-bodied chaser) and a damselfly joined us and flew around before a female broad-bodied chaser came and laid her eggs on one of the plants in the pond. There is no doubt that the pond is becoming well established and thanks to all the groups for their help in proving that and for 4 very enjoyable evenings. Roll on next year. We are making an effort to diversify in Maes y Pant and introduce some popular wild flowers on site. Thanks to sponsorship, we were able to buy seeds suitable for the soil conditions from Landlife Wildlife flowers. These have not yet propagated which is disappointing, however we're not despairing as we had a similar experience last year when the brownies and badgers planted in the meadow but late in the season we had mallows flowering and this year cowslips and viper's buglos, which have bright purple spikes of flowers. We know we don't have buglos locally so they've come from the seeds planted. It pays to be patient. Thanks in this case to Beryl Blackmore and her guides group for the sowing. 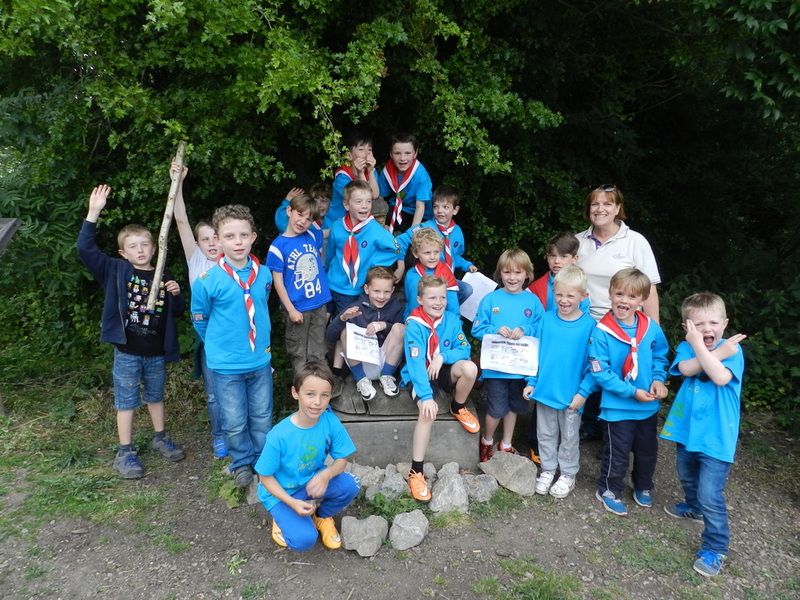 Finally, we have the last (but not least) of the helpers for 2015 - the Gresford Beavers - see above. A likely bunch who managed to put poor old Stan totally in the shade. I wasn't involved in this one. I don't think I'd have survived! Well done everyone. Thank you to everyone who supported the coffee morning and plant sale held in Church House on May 9th. We took £336 which will help towards running costs of Maes-y-Pant. We are very grateful to people who donated plants, and to everyone who came along on the morning for refreshments …. bought cakes, raffle tickets, and books which All Saints Church had left over from their book sale and allowed us to sell for our funds. We had a great variety of plants and sold most of them at the event - the few that remained were sold at the entrance to Maes-y-Pant the next morning. Special thanks to Lesley, Janet and Jill who cheerfully and efficiently ran the kitchen and refreshments for us. Key job, key people and we couldn't have managed without them! Maes y Pant Action Group (MyPAG) put in a submission for a Community Award from Tidy Wales. The submission was based on our achievements in 2014. We were shortlisted for one of 9 categories. The presentation was held on 28 April 2015 in the Pierhead Buildings, Cardiff and we won our category - the Community Transformation Award for 2014. This was quite an achievement as there was stiff competition from over 80 entries in total. However more was to come as there was an Award for the overall winner for achievements during 2014 and we WON that as well! Greedy or what! The awards were presented by the Minister for Environmental Affairs, Carl Sergeant and former Welsh rugby player, Tom Shanklin. We were also awarded a total of £500 and a large trophy for each which will be displayed in the Gresford Community Library after our 2nd Annual friends meeting on 12 May. Below are some photos. 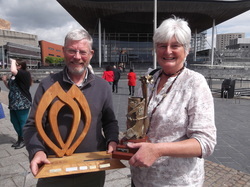 LEFT - Chairman, Trevor Britton and Fundraising Officer, Sue Kelly, standing outside the Welsh Assembly Buildings with the 2014 Group Transformation Award Trophy and the 2014 Overall Winners Award Trophy. The final outcome of the awards from the Airbus / Leader competition were announced today at a presentation event held at Airbus in Broughton on 15th April. It seems there were 91 applicants in total for the awards, which came from projects in Chester, Ellesmere Port, Flintshire and Wrexham. 10 were shortlisted and received £500 for their projects, so Maes-y-Pant project was very fortunate to be one of the short-listed projects. Results were announced in reverse order and our project came 7th which considering the competition was a great result, and we are very grateful to everyone who supported us. And our congratulations go to the other projects, in particular Riding for the Disabled who won the top award. Actif Woods 'Seniors' Weekly exercise group continues from Wednesday 22nd April, meet at 3.45pm in the car park. These exercise groups are subsidised by Actif Woods and cost only £2 per person per session, a great way of enjoying exercise at your own pace led by Claire Sutcliffe, a highly qualified local fitness instructor to advise and guide your progress. Also very sociable! Perfect for people who would love to benefit from exercising in the beautiful woodland setting and might benefit from advice on health and fitness. Also an opportunity to benefit from the 'Woodland Gym' facilities, and a very uplifting experience all round. Excellent news, we have been shortlisted for an award from a community funding scheme organised by AIRBUS and the Leader newspaper. Being shortlisted means we already have an award of £500 but if we collect sufficient coupons (being printed in the Leader from 9-25 March) we could win an award of up to £3500. The funds will be used for a project involving local schoolchildren to design artworks, art installations that they would like to see in the quarry, and then these will be shared with college and uni student for them to create and site the works. If we manage to win the main award, we hope to invite internationally famous tree-carver Simon O'Rourke, who created and donated the 'quarryman' sculpture, to spend some time on site to work with the students and create some wood-carvings on tree stumps. So lots of possibilities, lots of potential, lots of ideas…… and the more money we get, the more that can be done. To help us achieve this, please can you spread the word and save your coupons (and your friends, and relatives….) and let us have them after the closing date on March 25th. Coupons can be left in All Saints Church and Church House: also in Marford Community Centre, Gresford Memorial Hall, and Gresford Library. PHOTOGRAPHERS / PHOTOGRAPHS NEEDED - PRIZES TO BE WON!! We've had this plea through from Skipton Building Society's 'Grass Roots Giving' team, following MyPAG's recent successful bid for funding towards the cost of purchasing new benches in Maes-y-Pant. "As you may have seen on social media, we are looking to showcase you as one of our fabulous 161 winners within your local press, in order to highlight the brilliant work being carried out in communities throughout the UK. However, it would take us too long to take our camera and visit every single winner, so we need your help! We’re looking for local amateur or hobby photographers to help us photograph our winners and get a few snaps of you in action so we can showcase you some more! Could you please help us spread the word to any local photographers that you may know, be this friends, family or even members of your community group? We’re asking for the photographers to send across their best 5 images of their group, and the winner will be awarded £200 worth of gift vouchers of their choice. Maes-y-Pant has been short-listed for a 'Tidy Wales' Community award, which takes place at an event in Cardiff on 27th April 2015. Filming prior to the event may be taking place in Maes-y-Pant over the coming weeks. There have been a few incidences of dog attacks in recent months, some of them very unpleasant and requiring extensive veterinary treatment. Whilst such incidents are rare, they can be very upsetting for pets and owners, and treatment very costly. We urge you to report details of any such incidents to the police, and please also let us know. We keep a record of all reports which we share with the police, and persistent offenders will be banned from Maes-y-Pant and may be prosecuted. During September we asked our supporters to vote for us to help us win £500 from Skipton Building Society's 'Grassroots Giving' community awards scheme. Excellent news from Skipton Building Society today….. all your votes were very effective, and Maes-y-Pant have been awarded a £500 grant! Our thanks to everyone who supported us by voting, we couldn't have done this without you! Its been a busy October week in Maes-y-Pant. On Sunday volunteers spent the morning tidying the meadow area following recent mowing and clearing of brambles and mare's tails. 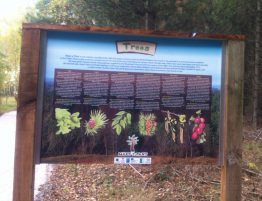 On Thursday four interpretation boards were sited in the pond; woodland gym; meadow and arboretum areas. The signs were designed by Dave Savage and Alan Jones of Mako Creative Solutions, produced and sitedby APH Signs, both local businesses from Llay. 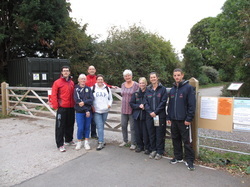 Also the long-awaited resurfacing of the 'All Abilities' footpath finally happened thanks to Steve Morris and his team. All it needs now is rolling once the dust has had a few days to settle. Great to see pushchairs gliding smoothly along the surface! We are ever grateful to our funders for supporting the projects that we carry out - the interpretation boards, like the benches, received funding through the Rural Development Plan for Wales 2007-2013 which is funded by the Welsh Government and the European Agricultural Fund for Rural Development. The Big Lottery has paid for the footpaths resurfacing …… so money from all our losing tickets has gone to a very good home, I think! Illustrated is one of three new benches sited in Maes-y-Pant in early October, The new benches are, like the existing benches, made by Wynnstay Sawmills of oak from sustainable sources and are in the Woodland Gym area, on the meadow, and beside the new pond. This project has received funding through the Rural Development Plan for Wales 2007-2013 which is funded by the Welsh Government and the European Agricultural Fund for Rural Development. Finally, after a very busy two weeks, the pond excavation is complete. We expect that the pond will fill slowly over the next two years with rainfall. The drainage channel running into the pond has been stopped up for now as water cascading from the drainpipe would wash away the sand below. Whilst the pond is filling, some of the sandy sides are likely to slip into the bottom of the pond, making it shallower than it looks at present. The surrounding area will be seeded and appropriate plants from certified sources will be planted over time. We hope to involve local children with this work. The pond has a bentonite (clay) liner which will prevent water soaking away. We do ask that visitors don’t introduce anything into the pond – no frogspawn or tadpoles, no plants and pondweeds from your own garden ponds. Invasive species can make their way into the water as tiny spores, but species such as Canadian Waterweed (Elodea canadensis) can quickly create havoc, taking over a pond and damaging the environment for wildlife species that we hope to encourage. Another benefit we've had from the Big Lottery has been funding to purchase a chainsaw, protective clothing and the fees for two of our volunteers to go on a safety training course. We hope in future when we have fallen or weak trees that need attention, our volunteers can react swiftly to deal with any problems. Our thanks to Terrier Tools for advice on equipment, and generous purchase terms for our local community project. The meadow has been mown and large swathes of brambles cut back and brought under control, along with large areas of ‘Mares tails’ (Equisetum arvense). More work needs to be done to the meadow but this will be carried out by volunteers, and won’t involve use of heavy plant. funding we now have four scythes and are happy to encourage volunteers to come along and try their hand at this method of grasscutting. Apparently the BHF donates £6 million per annum to health services in Wales so fundraising is a vital part of their work. We hope that the BHF will use Maes-y-Pant for further activities both as therapy for recovering patients, and for future fund-raising activities. During week commencing 21 September, we have been made aware of instances of trees being damaged and cut down, artificial bike jumps and tracks being created. This in addition to threatening behaviour, physical and verbal abuse of visitors where young cyclists gather. Litter must not be deposited. There are no dedicated cycle paths and cyclists should remember that pedestrians have priority at all times. The cutting of trees, shrubs and bushes is strictly prohibited, as is the excavation or creation of artificial hazards or jumps. Any person found carrying out such activities will be reported to the police for prosecution for criminal damage. Whilst we are reluctant to involve police in activities in the quarry, where serious breaches of 'conditions of use' take place, and members of the public are subject to verbal and physical intimidation, police WILL be notified and action WILL be taken against perpetrators. If you experience problems please email us through the contact address on the website, or for urgent problems contact the police on 101. PLEASE ENSURE YOU AVOID AFFECTED AREAS AND COMPLY WITH SAFETY WARNINGS. FOR EVERYONE’S SAFETY, DOGS MUST BE KEPT ON LEASH WHEREVER EQUIPMENT AND CONTRACTORS ARE OPERATING. We'd like to thank the people who regularly, daily in some cases, walk round Maes-y-Pant with plastic bags collecting up the rubbish dropped by selfish individuals too lazy to take their litter home with them. Without these supporters Maes-y-Pant would not be anything like as enjoyable an environment as it is, for all users. Reminder notices have been put up for people to take their litter home in the worst affected areas. This evening five boys on bikes, having had the situation regarding rubbish nuisance explained to them, were persuaded to clear up the area they were using, even though apparently it wasn't their rubbish. Their spirit of cooperation was welcomed and we hope that others will follow their example. I'm sure their parents would be proud of them! Work to smooth the surface of the 'all abilities footpath' to improve it for wheelchairs, pushchairs, people using crutches. Another piece of equipment for the Woodland Gym, this time a sit-up bench which is being provided by Actif Woods who in turn have been funding the 'Over 50's' fitness sessions. And the good news is that with their support these sessions will be extended, although this time at a very modest cost, for a further ten weeks taking us almost to Christmas. We're applying for funds to arrange for an art project to be created by young people so please let us have your ideas, and let us know if you would like to be involved. "We have had hundreds of amazing applications and we've really loved reading about all the fantastic work going on in communities throughout the UK. To make it to the short-list stage you beat off hundreds of other applicants and were able to clearly demonstrate the positive impact you make in your local community. Voting goes live on the 1st September and this link is also where you will click through to begin voting to receive the donation. Voting is open for a month and so please spread the word to your group, family and friends in order to gain as many votes as possible. " Our thanks to the 'Keep Wales Tidy' team who have generously granted MyPAG the sum of £343 for essential tools and equipment, for use by our team of volunteers. Our thanks to Phil Jones and all those who organised, participated in and supported Gresford Festival on August 25th. We enjoyed meeting many visitors to the Maes-y-Pant stand and hope to see more new faces visiting the old quarry, and maybe supporting our volunteer sessions. It was a great community day, and the rain did nothing to dampen peoples' spirits - there was a great buzz all day long and very rewarding for those who put in so much hard work organising the event. Thanks, everyone! Here's to next year ..... when do we start planning? Exercise sessions for 'over 50's' are to be organised and run by Actif Woods in Maes-y-Pant for a trial period. They will be starting early in August - dates and times to be confirmed so look out on site for notices, and there will be updates on this website. We have a lovely display of orchids in Maes-y-Pant again this year, which we hope everyone will enjoy and respect. We know that the vast majority of visitors respect the countryside code and take care to protect the flowers and plants, particularly rare specimens. Unfortunately, it seems that some attempts have been made to dig up orchids on site. We are very concerned about this, as it stops all of us enjoying the plants. The digging up of wildflowers is an offence under the 1981 Wildlife and Countryside Act (with a penalty of up to £5000). 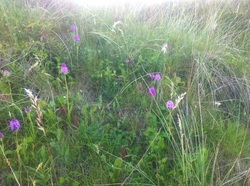 Sadly, wild orchids do not survive if transplanted, so we are all losers. We would ask that you don't pick the orchids or indeed any unusual flowers (we're still working out what we have on site and a rarity may be destroyed). If you do see someone digging up plants in Maes-y-Pant, please let us know. Picking flowe rs is still an enjoyment we are happy to let children take pleasure in and there are plenty of them to choose from, such as ox-eye daisies or campions and if done in moderation, so please take care when picking flowers, and no digging up of plants! Our thanks to Sion Jinkinson for putting on the 'Scything Workshop' in Maes-y-Pant on June 21st. We now have a trained team of volunteer scythers, who will be able to keep down nettles and brambles alongside the footpaths. And of course thanks to the volunteers who gave up part of their Saturday to participate. We may be able to integrate 'scything' into the Woodland Gym exercises - works out the knees, hips, back, arms, muscles with very rewarding practical results into the bargain! We have been awarded Grant Funding to put in three more benches two of which will be sited by the pond (when its completed), the third will go on the meadow at the top of the site. 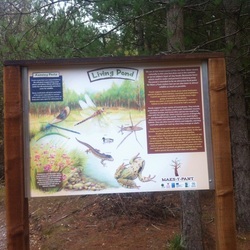 We're also having four bi-lingual interpretation boards in the pond area, the meadow area, Arboretum, and by the Woodland Gym. The funding has to be spent before the end of August so things should get moving quite soon. 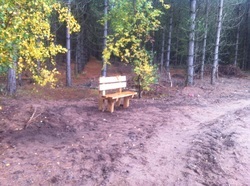 If anyone would like to adopt a bench, please email quarrykelly@hotmail.co.uk for details. We're holding a scything course in the meadow area on 21st June, from 10.00am - 3.00pm so if you're interested please contact us via the website, or email quarrykelly@hotmail.co.uk . Sion Jinkinson will be running the course. Places are limited, so please let us know as soon as possible. You won't need to stay around for the whole time, 2-3 hours during the day should see you trained! Equipment is provided. We're also hoping to have two of our volunteers trained to use a chainsaw, and purchase all the safety gear that will be needed for them. This would mean that following storms if trees and branches come down, or when trees become weakened or vulnerable we will be able to react immediately and remedy the problem ourselves without having to wait, and pay for, professionals to do the work. 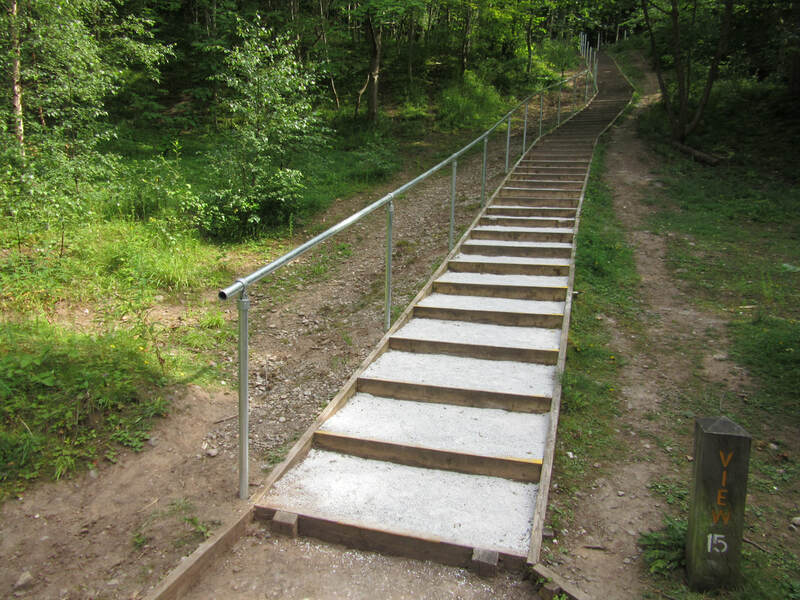 We've had some quotes to improve the 'all abilities' footpath which currently is not a good surface for people using wheelchairs, crutches or pushchairs, the rough stone surface needs to be much smoother. Hopefully this work can be completed before the end of the summer. Our thanks to Steve Morris and his team for doing a fine job in making up the bellmouth of the car park to Highways standard for us. This was the last hurdle we had to tackle in order to comply with planning permission when we changed the use of the site from fomer quarry / commercial woodland, to community recreation facility. Our gratitude too to Gresford Community Council for covering the cost of the work for us. No funders would touch the project as the land is outside the site boundary therefore it didn't qualify for grant aid. Thanks to grant funding from Northern Marches Cymru's Rural Environmental Project (via the European Agricultural Fund for Rural Development; Wrexham County Borough Council; Welsh Government and Leader Plus) and MBNA International, four items of outdoor exercise equipment have been purchased for the use of our more energetic visitors. The first two items were installed on May 6th, the remaining items are due to be sited week commencing 26th May. Please use the equipment safely. Early in April the North Wales Wildlife Trust gave us 49 fruit trees to plant in Maes-y-Pant. Mainly apple with some plum and cherry trees too. These have mainly been planted in the meadow, with 13 in the Arboretum area. A number of the trees are old Welsh varieties. They've been planted well apart as directed, in part to allow light for wildflowers to grow between the plants to help with pollination. Speaking of which we have had a team of environmental enthusiasts from St Peters School Rossett along to plant wildflower seeds which were donated from Kew Gardens 'Grow Wild' campaign - these were scattered by the children in the arboretum area, and two insect houses were made by the pupils and sited nearby to encourage bees, lacewings, and other pollinators. Hot on the heels of the Rossett childrens' visit, we went to Marford's Rofft School where members of their Gardening Club planted cowslip and primrose seeds, and also created and put up insect houses. 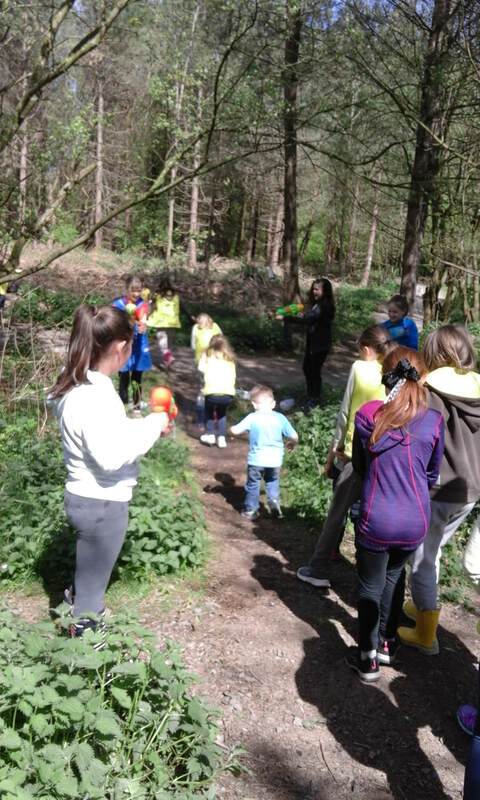 After Easter we hope to scatter more seeds in Maes-y-Pant with pupils from All Saints School Gresford, and local Brownies and Beavers. We are very pleased that the schoolchildren (and teachers) are taking an interest in Maes-y-Pant, and hope that a lifelong connection will be made. We were very lucky to have Kate Thomson, Education Officer of Natural Resources Wales along to help out. Kate is a good friend to Maes-y-Pant and has many skills, amongst them den-building and we hope to see a lot more of Kate and the schoolchildren in the future. With the help of Kate Thomson, Education officer of Natural Resources Wales, we are aiming to work with Rofft School Marford and St Peters School Rossett as well as Brownie, Guide and Beaver groups locally to encourage young people to grow, plant and learn about wildflowers and their importance to pollinating insects. So look out for a patchwork of stunning colours, and listen for the hum of happy insects over the coming months! We have now received several tenders for preparing the pond and site visits have been made to view what was required. The location will be in the centre of the site (marked on the new leaflets) and there will be good views from the bench already sited there. Digging the ground and gaining access is very difficult at present whilst the area is so wet. It is unlikely that we will start work on this until this summer (2014), likely to be September. We are looking to create a pond area of about 400 square metres lined with a Bentonite clay mat. The edges of the pond will be gently sloped both for safety reasons and to improve wildlife habitat. There will also be a couple of 'scrapes' at different depths to provide a better wildlife diversity but these won't be lined and will dry out in the summer months. Although this work is being funded following our success in the Lloyds Bank Community Awards, some of the work , such as grading the pond edges will be done by volunteers. This will help us to use the award to its maximum benefit. We also hope to involve young volunteers to scatter seeds of native plants in the area to complete the work. During January, homes in Gresford and Marford should have received an information leaflet giving details and a map of Maes-y-Pant. The bi-lingual leaflets were designed and printed by local company Mako Creative and MyPAG received funding support towards the cost of the leaflet from Menter Iaith, without whose help the leaflet would not have happened! There will also be information about how to become a 'Friend of Maes-y-Pant', and details of what benefits this involves. MyPAG is delighted to have received £1000 support from The MBNA Foundation towards the cost of exercise equipment to be sited in a discreet area of Maes-y-Pant. In March a further £2525 was made available through EAFRD funding via the Welsh Government, Northern Marches Cymru's Rural Environmental Project Grant Scheme, Leader, and Wrexham County Borough Council. Combining the two grants will enable us to instal a set of parallel bars; 'chin-up' bars; a balance beam and a set of low 'stride jumps'. Many local people now exercise in the old quarry eg. jogging, running, participating in the Friday ‘boot camp’ - and we hope that a ‘woodland gym’ will encourage people of all ages to try some of the equipment. There will be equipment for all sizes, ages and abilities, so no excuse not to have a go! the many of us who have only ever appreciated it from afar! Our thanks to Gresford Community Council, who have come to our rescue to fund the highways work necessary to the entrance of Maes-y-Pant. Work is likely to be carried out in late January or early February, so please look out for and comply with notices giving more details, as obviously the car park may be inaccessible for a few days. Meantime, WCBC Planners have now agreed that the car park can be used in its existing form with immediate effect to minimise problems caused by people parking outside Maes-y-Pant gates along Pant Lane. THANK YOU to everyone who voted for our Maes-y-Pant pond project in the Lloyds Bank funding competition. Voting closed on 1 November, and it was announced on 26 November that by a very, very narrow margin MyPAG came in second place out of the four local entrants, which means that we will receive an award of £3000 from the Lloyds Bank Community Fund to enable us to create a wildlife pond in Maes-y-Pant. Every vote was important - this was a real community effort and MyPAG is very grateful for your support. We are really looking forward to creating the pond, and expect work to commence in January. We hope that we will have the support of interested community volunteers to help with the project. Two of our members recently went on a 'Pond Workshop', funded in part by Environment Wales, and are very keen to get started on the project. 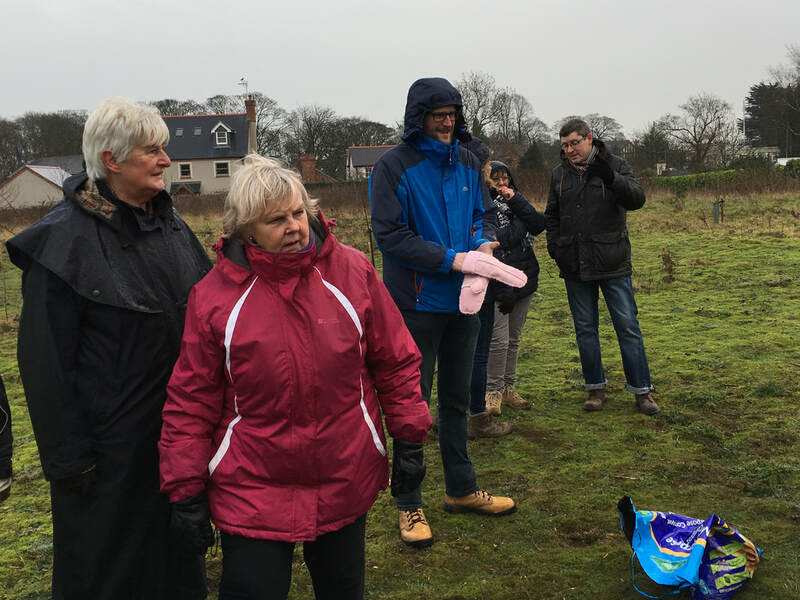 We also appreciate the support of MP Ian Lucas who visited the quarry to see general progress, and take a look at the site of the proposed pond. CALON FM ... Special thanks to our very good friend Dave Williams of Calon fm for giving us some air time yet again today - our third broadcast about the Maes-y-Pant project. Hopefully the broadcast will generate a few more votes towards our Lloyds Bank Community Grant application for the £3000 funds to create a wildlife pond in Maes-y-Pant. And we were allowed to indulge in choosing a special piece of music of our choice ...... a bit of Led Zeppelin and a bit of Bill Withers, along with, very appropriately, Lou Reid's 'Walk on the Wild Side'. Great hour, thanks, Dave! Beryl Blackmore organised an excellent display of scarecrows, made by local young people for Hallowe'en. Our thanks to Beryl Blackmore and her team of designers for brightening up the weekend for us...... they were great fun, and clearly lots of hard work had gone into the creations! .......and not a crow in sight!!! We are approaching 'Keep Wales Tidy' for a grant to buy wildflower seeeds and bluebell bulbs, and hope to work with local schools and youth groups to grow the seeds and plant the bulbs over the winter / spring, ready to plant out when appropriate. 'Keep Wales Tidy' and Shane Hughes have been very supportive of our project, and their support is greatly appreciated. 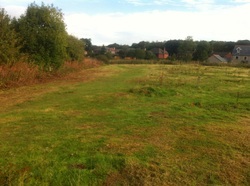 August 31st saw a team of MyPAG volunteers led by chairman Trevor, landscape the land alongside the newly made car park. MyPAG is very grateful to all who took part, and who helped to source and provide the trees, plants and shrubs. 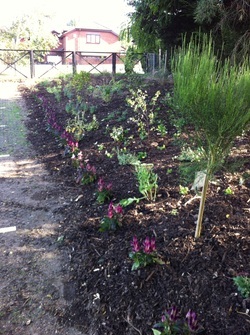 Special thanks to B&Q who at short notice provided a colourful array of surplus plants to add colour to the area. FOOTPATHS We hope to get a finer, smoother surface laid onto the 'all abilities' footpath to make the experience smoother and easier for users. We also hope to hold a 'Volunteer Day' to sweep off the loose stones on the rest of the footpaths and make the surface more comfortable for users. There will soon (date to be advised) be a Volunteer Training Day led by North Wales Wildlife Trust, for volunteers to be trained on safe use of the bruchcutter, strimmer and chipper/shredder. The training will take place on the top, informal footpath that was re-opened last year but has become overgrown during the summer: it should be accessible again very soon and now that we have equipment available the overgrowth shouldn't be a problem in future. Provided, of course, that we have sufficient volunteers to share the work! BENCHES We are siting two more benches around the quarry, one at the top end of the 'all-abilities' footpath, and another close to the main gate. If you would like to sponsor a bench, we still require a volunteer to sponsor the one at the main gate. Please contact trevorbritton@btinternet.com Tel 01978 855266 for further information. Griffiths, and MP Ian Lucas. However we could not manage without the generosity of grant funding, and funders - and grants from numerous sources. Heartfelt thanks to all our volunteers and funders! VOLUNTEER DAY JULY 7th 2013 - Thanks to everyone who came along and lent a hand for this exercise. It was a very hot day, and those who took part did a great job back-filling the steps to the viewing point. 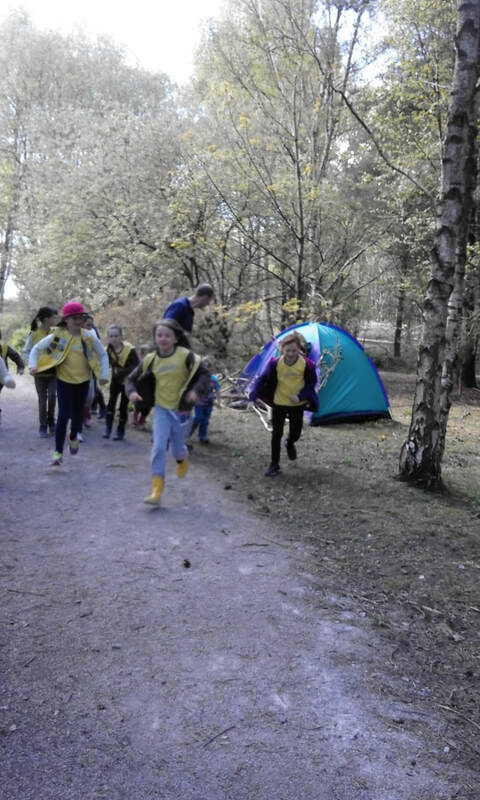 Great to see the quarry being used by pupils from St. Peters School Rossett, and local Brownies and Rainbows. Have fun! Thanks to those who signed up to do a First Aid course ... Eight of us duly attended the First Aid course organised at Groundwork Trust, and once our certificates are delivered, we have eight qualified first-aiders. Thanks to Lou and Groundwork, and to Environment Wales who substantially funded the course for us. It was an excellent course - If you would like to be considered for a future course please contact us via the website and we will see what we can do. We are dependent on grant funding to participate but if we have enough regular volunteers on the waiting list, hopefully this can be arranged! And thanks to Alison of B2C for facilitating the project for us. We are very fortunate to have the benefit of such great people supporting us. The work was carried out at no cost to MyPAG, and we are very grateful for this support which will improve the area for all users. It's early March and we're delighted that the footpaths are now complete; nine benches have been sited; a new main gateway, 'A' frame and fence constructed at the Pant Lane entrance as well as and 'A' frame and fence at the Whiteway Drive entry. The splendid quarryman from Simon O'Rourke now sits wearily at the main gate on a purpose-made plinth, and three very colourful and informative interpretation boards have been sited at the three main entry points to Maes-y-Pant, designed by Jo Dansen with drawings from pupils of All Saints Gresford and Marford Rofft Schools. 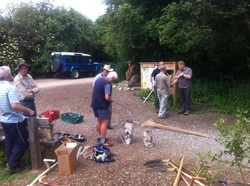 Volunteers have helped to clear and re-open an informal footpath running from Pant Lane entrance along the top of the quarry to the Viewpoint, where a panorama board has been constructed. One of nine benches installed on the site mid-February - this one is at the viewpoint, a reward for climbing the 109 steps to the top. In front of the bench the beginnings of a panorama board construction can be seen. Well what a day it was! 420+ trees planted with the help of children from All Saints and Rofft schools, Marford Pre-school Playgroup and After-school Club, Rainbows, Brownies, Guides, Beavers, Cubs, Scouts, students from Darland School, Yale college, Glyndwr and Bangor universities ….. Gresford Community Council planted the ‘Gresford Jubilee Oak’ in a prominent position by the main footpath. All supported of course by staff from the BBC, Woodland Trust, Groundwork Trust, North Wales Wildlife Trust, as well as Lisa with her excellent refreshments, Cutting Edge with their equipment and skills, and of course Lawtons who have been working very hard with the project for several weeks now. The BBC spent three days in Gresford filming and recruiting Volunteers, and it was a treat to see Bryan Formstone and his amazing collection of insects and moths that he has found in the quarry. It was a pity that presenter Mike Dilger was called away, he is so enthusiastic and had planned to do some work with children on habitat creation but unfortunately there was no time. However this meant that the lovely Lucy Siegle joined us instead, and led the live broadcasts on Wednesday night. Big surprises on the night when we were presented with a painting of the imagined view of the newly planted trees in a few years time when they have grown considerably, painted by local artist Keith Evans, and local sculptor Simon O’Rourke’s fantastic chain-saw sculpture of a seated quarryman, resting from his hard labours. Simon used a large piece of oak that came from Marchwiel, and created the work at 24 hours notice. Amazing! The Quarryman will be moved to his permanent home when we have equipment strong enough to move it, and when the final resting place is decided. All in all a quite extraordinary and exhilarating event, which was only possible through the support and involvement of so many local people. We hope everyone enjoyed it, and that particularly through the younger people planting trees on the site, future generations will feel a real link with Maes-y-Pant. Our thanks to Dave Williams and Calon FM for inviting us along to take part in their Community Focus broadcasts last November (2012) and in March 2013. Dave interviewed Chairman Trevor Britton and Sue Kelly and enabled them to share the project and progress with listeners from throughout the Wrexham area and beyond. And for good measure played some of their music requests too! IF YOU HAVE ANY OLD OR INTERESTING PHOTOS OF THE SITE, PLEASE CAN WE TAKE COPIES FOR OUR WEBSITE, AND RECORDS? MyPAG aims to set up three teams of volunteers (6 – 8 people) for basic maintenance of the quarry in future years. 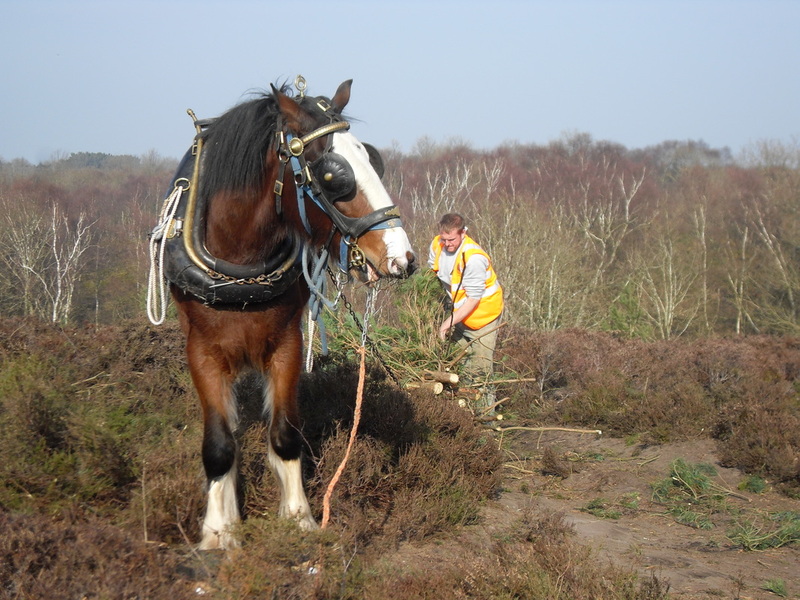 We hope that volunteers will be willing to give a day of their time, four times per year, to carry out tasks such as ensuring footpaths are clear and safe, checking trees for safety, cutting back overgrowth of trees, shrubs and grassland, monitoring wildlife habitats on site and any other tasks that might be required. Numbers for the training days are limited – we hope to hold regular training days throughout the year. PLEASE NOTE THAT WHEN WALKING DOGS IN THE QUARRY, IT IS THE RESPONSIBILITY OF THE OWNER TO ENSURE THAT DOGS ARE UNDER CONTROL AT ALL TIMES. any relevant information where possible. We appreciate and encourage dog owners cleaning up after their pets, but PLEASE don’t leave the bags lying around on the land. There are bins at both Pant Lane entrances where the bags can be deposited. Thank you for your cooperation! Members of the public are invited to use the property for walking, dog walking, jogging and similar leisure activities provided they behave with due consideration for other users and wildlife. Litter must not be deposited. Access between dusk and dawn is prohibited as is the lighting of fires or barbecues. Users are reminded that this is an area of rough woodland and appropriate care should be taken and that entry is at the users own risk. The managing agents are North Wales Wildlife Trust and their employees have full authority to require anyone who they consider to be behaving inappropriately to leave the property immediately. The cutting of trees, shrubs and bushes is strictly prohibited, as is the excavation or creation of artificial hazards or jumps. Any person found carrying out such activities will be reported to the police for prosecution for criminal damage. The use of firearms, air weapons, bows, slings or catapults or snares is absolutely prohibited. 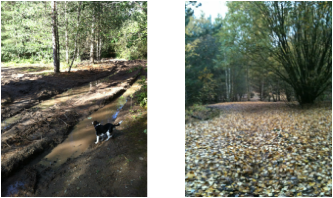 Dog walkers must keep dogs under proper control and must keep paths free from fouling by their pets. There are no public rights of way over the property and there is no intention to create or dedicate any such rights. MAES Y PANT has been acquired by Maes y Pant / Hollowfield Action Group Limited (reg. no. 06221374) to manage on behalf of the community. Members of the public are invited to use the property for walking, dog walking, jogging and similar leisure activities provided they behave with due consideration for other users and wildlife. Users are reminded that this is an area of rough woodland and appropriate care should be taken. Entry is at the users own risk. carrying out such activities will be reported to the police for prosecution for criminal damage.